Using exclusively designed & fabricated Smith Performance Specialties race components especially designed to fit under the bed of your truck box while maintaining a low stance. All miscellaneous hardware zinc dichromate plated. Lightweight manual steering box. N.H.R.A. accepted. Bolts directly onto the original mount on frame. Modified centre link, idler arm, and steering arms and all hardware to correct bump steer and pan clearance. S-10 steering damper built to eliminate the wobble in front wheels which is common to conventional steering found in S-10 trucks and other applications in which caster has been increased in the front end. Universal kit is available to fit many other applications. Welding required. 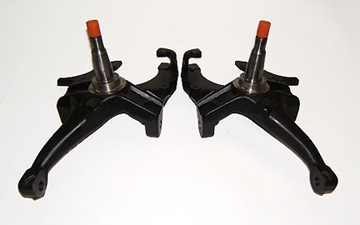 Short bodied pin top double adjustable shocks are used in S-10 trucks. Shocks are especially designed to have extra bump valving along with widely adjustable extension valving. Lower mounts and hardware are designed to attach to lower control arms with bushings supplied for pin type upper mount. Custom designed by Afco for S.P.S. Also available are Strange Engineering single adjustable shocks with special priority valving for this application. Strange - from $385 pr. Belltech 2" drop spindle allows front of truck to sit lower without compromising front end travel. Belltech is the leader in the industry of sport truck products and are the choice of S.P.S. in the fabrication of the Super Stock S-10 trucks. Heavy duty front hub and brake kit especially built by Strange Engineering to fit 1982-2002 S-10 & S-15 trucks meet with N.H.R.A. Super Stock standards. Kit features light weight billet aluminum front hubs and dust caps with Timken® bearings and seals, billet caliper bracket, Strange billet aluminum 4 piston calipers and brake pads, forged steel slotted rotors, and all required fasteners and wheel studs. Spindle requires modification to install this kit. Instructions included to perform modification or can be done by S.P.S.